Windows Activation service is a system service available with Windows vista and windows server 2008. It is available with IIS 7.0 and it is more powerful compared to IIS 6.0 because it supports Http, TCP and named pipes were IIS 6.0 supports only Http. It can be installed and configured separately. Before Start creating the service we need to configure the system to support WAS. Following are the step to configure WAS. Click Start -> Control Panel -> programs and Features and click 'Turn Windows Components On or Off' in left pane. Expand 'Microsoft .Net Framework 3.0' and enable "Windows Communication Foundation HTTP Activation" and "Windows Communication Foundation Non- HTTP Activation". Next we need to add Binding to the Default Web site. As an example, we will bind the default web site to the TCP protocol. Go to the Start menu -> Programs ->Accessories. Right click on the "Command Prompt" item, and select "Run as administrator" from the context menu. That command adds the net.tcp site binding to the default web site by modifying the applicationHost.config file located in the "C:\Windows\system32\inetsrv\config" directory. Similarly we can add different protocols to the Default Web site. 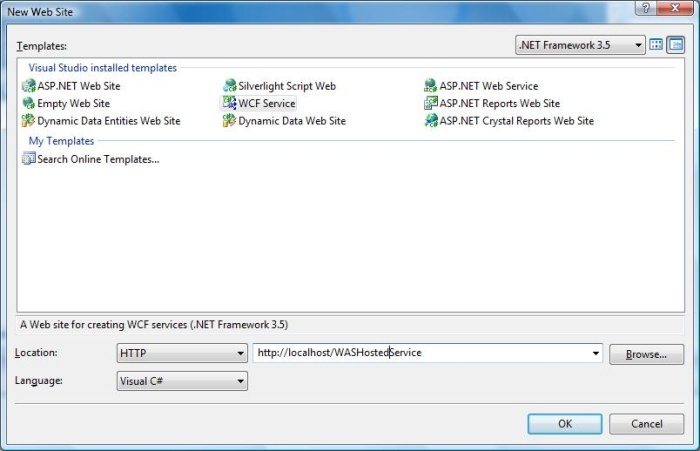 Step 1: Next we are going to create the service, Open the Visual Studio 2008 and click New->WebSite and select WCF Service from the template and Location as HTTP as shown below. Step 2: Create the Contract by creating interface IMathService and add ServiceContract attribute to the interface and add OperationContract attribute to the method declaration. Step 3: Implementation of the IMathService interface is shown below. Step 4: Service file is shown below. <%@ ServiceHost Language="C#" Debug="true" Service="MathService"
faults for debugging purposes, set the value below to true. Go to the Start menu -> Programs ->Accessories. Right click on the "Command Prompt" item, and select "Run as administrator" from the context menu. Output will be shown below. Proxy and configuration file are generated in the corresponding location. 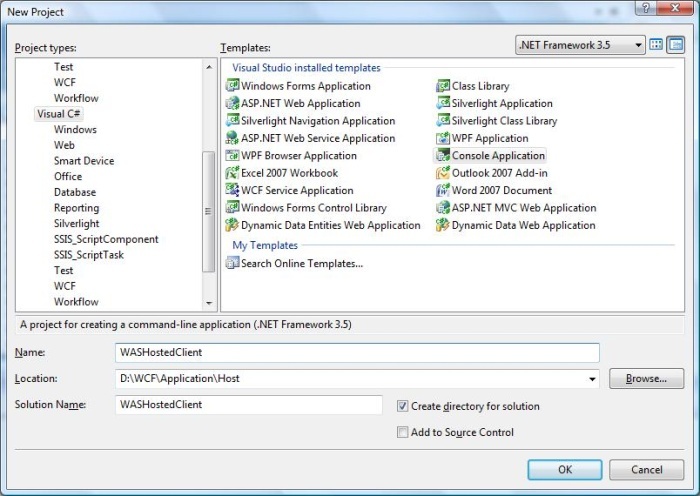 Step 6: Create the client application as shown below and add the reference 'System.ServiceModel', this is the core dll for WCF. 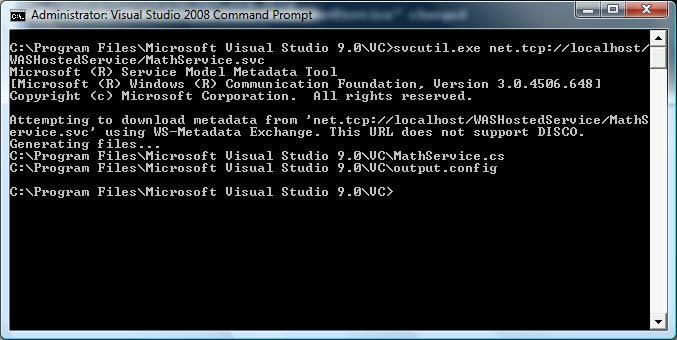 Step 8: Add the proxy class and configuration file to the client application. Create the object for the MathServiceClient and call the method. The output will be shown as below.